The all new Cube T8 Dual sim 4G LTE is a new exceptionally high quality phone tablet PC with phone function in a super slim body. Cube T8 4G LTE is WiFi 4G tablet PC so you can use 4G network for super fast speeds, it also supports 3G sim cards. Marca ALLDOCUBE Modelo iplay 8/U78 MPN B0-00506-14 EAN No aplicable Tipo Tablet Sistema operativo Android 6.0.X Marshmallow Tamaño de pantalla 7,85" Resolución 1024 x 768 Capacidad de almacenamiento 16 GB RAM 1 GB Procesador Quad Core Color principal Gris Conexión a internet Wi-Fi Conexiones Bluetooth Velocidad del procesador 1,30GHz MarcaALLDOCUBE Modeloiplay 8/U78(100% NEW) Mostrar pantalla7.85 inch 5-Point IPS HD Capacitive Touch Screen Resolución1024*768(Use different Software test may a little different, if any question, please messageus first) CPUMTK8163 Quad-Core A53 64-bit La frecuencia de la CPU1.30 GHz GPUMail T720-MP2 Tamaño de la memoria RAM1GB DDR3 Tamaño de la memoria ROM16GB (internal storage tablet storage. ProcessoreMediaTek Helio X20 (MTK6797), Mali-880MP4 GPU CoreDeca Core Display8,4″ Black Diamond LCD, risoluzione 2560×1600 Memoria4GB RAM 64GB ROM Camera13MP posteriore e 8MP frontale SIM CardNano SIM Card Slot,One is micro SIM slot OSAndroid 7.1 Batteria4500mAh Dimensioni217 x 126 x 7,8 mm Peso356g Il phablet è come nuovo ha 12 ore di vita usato solo per una recensione. SIM Quantity: Dual SIM. - ROM: 32GB. - SIM Type: Standard SIM Card. - CPU: MTK6737 Quad Core up to 1.3GHz. - RAM: 2GB. - Model: C5. - OS: Android 7.0. - 2 x SIM Card Slots. Model: Freer X9. - 1 x Freer X9 Tablet PC. - ROM: 64GB. Support Dual Band WiFi 802.11a/b/g/n/ac (2.4GHz 5GHz). - CPU: MTK8173 Quad Core 64 bit 2.0 GHz. - OS: Android 6.0. Support Bluetooth 4.0 for wireless data transmission. Model: M5S. New very high performances Deca Core CPU, fast and efficient. - CPU: MTK X20 (MT6797) Deca Core up to 2.3GHz. - 1 x M5S Tablet PC. - RAM: 3GB. - ROM: 32GB. - OS: Android 8.0. Support Dual Band WiFi 802.11a/b/g/n/ac (2.4GHz 5GHz) Module: MT6631. Model: KNote 5. - 1 x Kube Knote Tablet PC. Support an external Micro SD card, up to 128GB (not included). - ROM: 128GB. - 1 x TF Card Slot. - RAM: 4GB. - OS: Windows 10. - Languages: Dutch, English, French, Italian, Japanese, Russian, Note: The Windows system support multi-languages, the languages can be downloaded by yourself., Spanish, Simple Chinese. Has not been used much as wife now has a Lenovo tablet and so this has just been left on shelf. Android O/S is Kitkat 4.4.4 and Windows is 10 Pro (I paid for the upgrade), maybe not such a good idea as the latest update seems to have stopped the sound working in Windows mode but working fine in Android. Octa-Core CPU, 3GB RAM and a Mali T720 GPU for a great gaming and video experience. An Octa-Core CPU with 3GB of RAM is more than enough for gaming and multitasking while a Mali T760 GPU ensures smooth graphics throughout. 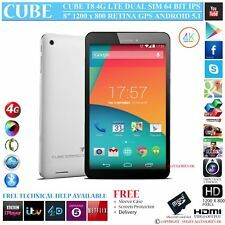 NEW CUBE i6 AIR 32GB DUAL OS WINDOWS 10 ANDROID 4.4 KITKAT 9.7". Cube i 6 Air matches Apple iPad Air's picture quality which is the benchmark for all tablets. This screen also supports 4 K/UltraHD videos and it is truly a pleasure to watch 4 K/UltraHD videos on the i6. Model: KNote 5. - 1 x KNote 5 Tablet PC. - ROM: 64GB. - RAM: 4GB. - OS: Windows 10. - WiFi: 802.11a, 802.11b, 802.11g, 802.11n, 802.11ac, Support, 2.4GHz/5GHz. It's possible?. The rugged smartphone, for example, have the display, and is made of glass. 1 x Cube iWork 10 Pro Tablet PC. - ROM: 64GB. - OS: Android 5.1, Windows 10. Support WiFi 802.11b/g/n(2.4GHz) Module: RTL8723BS. - RAM: 4GB. - WiFi: 802.11b, 802.11g, 802.11n, 2.4GHz. - Model: iWork10 Pro. 1 x KNote 8 i1301 Tablet PC. - Model: KNote 8. - ROM: 256GB SSD. You can expand the momory capacity with a Micro TF card. - RAM: 8GB. - OS: Windows 10. Note: The Windows system support multi-languages, the languages can be downloaded by yourself. Model: U63. - 1 x U63 Tablet PC. - SIM Quantity: Dual SIM. - ROM: 16GB. - SIM Type: Standard SIM Card. High performances and efficient Quad Core CPU up to 1.3GHz. - CPU: MTK MT6580 Quad Core 1.3GHz. CPU: MTK8783 Octa Core up to 1.3GHz. - Model: T10. - ROM: 32GB. Android 6.0 operation system. - RAM: 2GB. - OS: Android 6.0. - WiFi: 802.11a, 802.11b, 802.11g, 802.11n, Support, 2.4GHz/5GHz. - 1 x Cube T10 Tablet PC. Model: iPlay 8 U78. - 1 x Cube iPlay Tablet PC. - ROM: 16GB. - CPU: MT8163 Quad Core 1.3GHz. - RAM: 1GB. - OS: Android 6.0. - WiFi: 802.11a, 802.11b, 802.11g, 802.11n, 2.4GHz/5GHz. It's possible?. OS: Android 8.0 Oreo. Powerful Deca Core 1.6GHz processor. - CPU: MTK X27 (MT6797X) Deca Core Up to 2.6GHz. - RAM: 3GB. - Model: M8. Support Dual Band WiFi 802.11a/b/g/n/ac (2.4GHz 5GHz). - ROM: 32GB. SIM Quantity: Dual SIM. - ROM: 32GB. - SIM Type: Nano SIM Card. - RAM: 2GB. - OS: Android 7.0. Support Dual Band WiFi 802.11a/b/g/n (2.4GHz 5GHz) Module: MT6625L. - 2 x Nano SIM Card Slots. - 4G: FDD-LTE 1800/2100MHz. Model: M5X T1006X. - 1 x M5X T1006X Tablet PC. - ROM: 64GB. Support Dual Band WiFi 802.11a/b/g/n/ac (2.4GHz 5GHz). - RAM: 4GB. - OS: Android 8.0. - SIM slots: 2. - 2 x SIM Card Slots. ROM: 64GB. - SIM Quantity: Dual SIM. - Model: X1. - SIM Type: Nano SIM Card. - RAM: 4GB. - OS: Android 7.1. Support Bluetooth 4.0 for wireless data transmission. Support Dual Band WiFi 802.11a/b/g/n/ac (2.4GHz 5GHz) Module: MT6631. Model: M5 T1006. - 1 x M5 T1006 Tablet PC. - CPU: MTK X20 (MT6797) Deca Core Up to 2.3GHz. - ROM: 64GB. - SIM: Quantity Dual SIM. - RAM: 4GB. - OS: Android 8.0. Clear, vivid colors and suitable also for movies. Finger touch screen. Screen resolution:1366x768. Screen pixel density:148PPI. Support multi language and network connections. Size:38 24 4cm. Processor core:Quad core. Highest frequency:1.83GHz. Processor clocked:1.33GHz. MTK MT6753 Octa Core. Model ALLDOCUBE Power M3. CPU MT6753 Octa Core 64-bit 1.5GHz. 2GB RAM 32GB ROM. Capacity 32GB eMMc. Android 7.0 System. System Android 7.0. 4G FDD 1800/2100MHz (Band 3/1),TDD-LTE Band 38/39/40/41. TOUCH SCREEN GLASS FOR ALL WINNER CUBE Q7 MID TABLET 7.0 "BLACK PHOTO PRODUCED BY US. No respondemos por ninguna pérdida o robo. Si la garantía es ofrecida por Uldan Elettronica SRL, los productos defectuosos, con autorización previa, pueden devolverse y serán reemplazados. Model ALLDOCUBE Cube Freer X9. Included 1 xALLDOCUBE Cube Freer X9 Tablet. Capacity 64GB. CPU MTK MT8173 Quad Core 64-bit 2.0 GHz. System Android 6.0. and 4GB RAM 64GB ROM ! And this tablet supports Bluetooth/OTG function.